How can I use Gmail to send and receive email? How can I use an email client besides Gmail to send and receive email? What if I only want to receive and not send email? Our regular virtual hosting gives your group a website at mygroup.berkeley.edu. By contrast, mail virtual hosting lets you create as many email addresses as you'd like @mygroup.berkeley.edu. These addresses can be used both to receive mail (via mail forwarding), and send mail. The details of how to use these addresses are below. By default, groups only have regular web virtual hosting. If you'd like to get started using mail virtual hosting, send us an email at hostmaster@ocf.berkeley.edu letting us know you'd like to enable email virtual hosting. Be sure to include both the domain name, and your OCF account name. Once your domain is configured for mail, head over to our mail virtual hosting page to add and remove addresses. 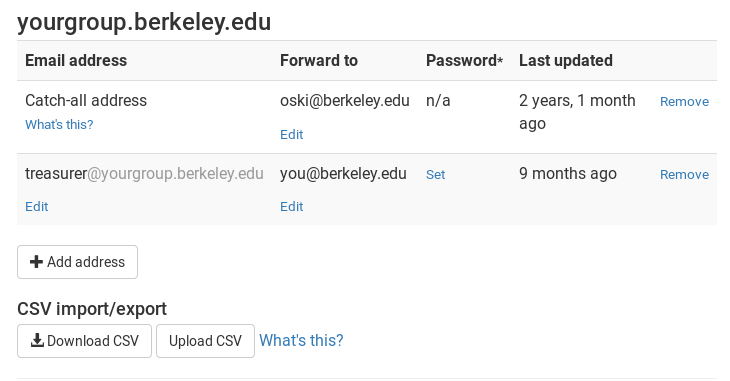 Mail forwarding: forward emails sent to xxxx@yourgroup.berkeley.edu to an email address you already own. Mail sending: send an email as xxxx@yourgroup.berkeley.edu. Lightweight user management: create different email addresses and configure who to forward them to. We provide instructions for setting this up with Gmail below, but other email providers and clients offer similar options. We have an entire page about that — click here! Note that we only provide email sending, so you only need to configure SMTP and not POP/IMAP. You can totally do that! Just set up an address to forward to and don't bother configuring the sending address. You can even leave the password blank.